25 search results for "eris"
She’s holding at 23 Aries and retrograde. hRMpf! Not with Saturn there, that’s for sure! It’s been a rough time for Earth’s population. Eris, the goddess of strife, is all about tension and the zodiac sign of Aries is always ready for action. (more tension) Being opposed (180 degrees of separation) for so long(months, and month, and months!) has certainly brought a keener understanding that the rules and obligations we have been living under have , just perhaps, become irrelevant? Saturn will be moving into Scorpio in early Oct. Eris will be less restricted in manifesting some inner fulfillment then. The next 36 hours will provide a clue towards answering that question. The moon is approaching her monthly conjunction with Eris, the goddess of chaos. Let’s start with today. Nov. 5, 2008 and check the ephemeris. She’s moving back into the 21st degree-zone on Nov. 10. Hmmm……and then in March, 09 she makes a quick little wiggle and returns to the 22nd degree-zone. Let’s check the Sabian Symbols again………………..
21deg. Aries – A Puglist Enters the Ring. 22 deg. Aries – The Gate to the Garden of All-Fulfilled Desires. Once again astrology seems to describe current day events. Looking at the track of Eris it’s easy to see that this dance of change will continue for quite some years to come. Eris moves very, very slow in a zodiac segment (aries) that prefers to move things along swiftly. It’s quite the dilemma for this goddess of strife. How does one allow conflicting tensions to co-exist with peace? What happens when you synthesize the sensations of ‘slow’ with the sensations of ‘fast’ ? Chiron/Neptune 2010 – The Rescue? Stay tuned. In this post we find that Eris has shifted back into the energetic orb of 21 degrees of Aries. The Universe works in some amazing ways. I think I just noticed something else about this ‘data’ on Eris. Look at it with me and please let me know if you see what I see. It appears to me that Eris tends to go retrograde a lot. I guess that’s because it’s so very, very far away. Retrograde motion (the appearance of going backwards) is common in astrology. The time period when the planet is in the process of switching is called ‘stationing’. Most astrologers agree that when a planet ‘stations’ the ‘energy of that planet’ intensifies. Yuck. Eris intensifying doesn’t sound like much fun. Eris, remember, is the goddess of strife. Hmmm. Not sure what this means, however I’d prefer forward motion myself unless we can actually clean up and resolve some of this worldly strife that seems to be affecting everyone, everywhere. Today, as stated in this last post, we’re looking at 22degrees of Aries for some interpretive material. Last time we looked into Dane Rudyhar’s degree analysis. Today we’ll look at Dr. Marc Edmund Jones for some clues. Sounds good to me. However by October we’re back to the difficulty of 21 deg. Aries where there is a “complete lack of personal sensitiveness”. Ugh. With Pluto, Uranus, Jupiter, and Mars all getting ready to enter into Cardinal signs, Eris is likely to be quite stimulated over the next few decades! So, the last time we discussed Eris we were talking about strife, discord, and chaos; looking for where in our lives those circumstances are showing up. For me, Eris lands smack in the center of my tenth house which is also populated by an Aries North Node. Eris in the tenth seems to be showing up by placing me in circumstances where I must ‘publicly’ assert myself in ways that are habitually uncomfortable. Hmm, that deserves a portion of my meditation time. Today had been March 31, 2007 and I can honestly say that there’s an awful lot of ‘strife’ in the world. My observations lead me to believe that the root cause is not Eris, or any other thing that is ‘outside’ of ourselves. Heal the strife within…..
April 9, 2007……thought I’d check in with Eris, the goddess of strife, discord, and struggles. Philip Sedgewick gives the astronomical position of Eris as 20AR46 as of April 2. When you have an orbiting planet/asteroid as far away as Eris is it helps to have some kind of reference/resource to help us understand. The Sabien Symbol for 21AR is ” A Pugilist Enters The Ring”. (I am refering to Dane Rudyhar’s book titled The Astrological Mandala) When Eris reaches 22AR, the forecast lightens up tremendously…..we then get to experience “the gate to the garden of all fulfilled desires.” Wow! Sounds special, doesn’t it? Let’s check back in and see when it’ll reach the twenty-second degree of Aries? …..April 30, 2007……enjoy it while it lasts because in Oct it develops retrograde motion and returns to the stance of the pugilist. Time passes slowly sometimes. Now it’s May 30, 2007 and Eris hasn’t budged. Continuing strife, discord and chaos……. and I can see the light, too. Moving thru this kind of Eris energy for decades without end can be really, really, stressful. Astronomers often disagree over what it is exactly that they’re seeing. 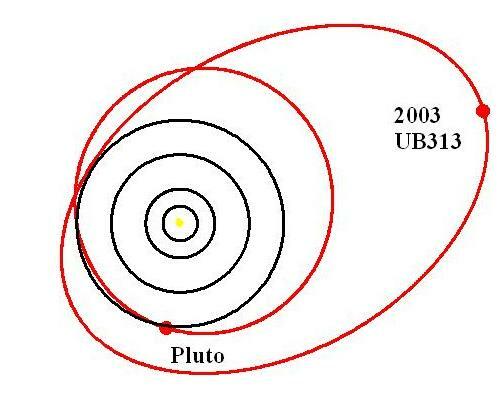 Recently, we’ve watched them downgrade planets to dwarf planets, and discover new dwarf planets that share our Sun. It takes a long time for science to prove something. Astrologers are also cautious when faced with the task of interpreting the symbolism and metaphysical energy of a new orbiting body. What the astrologers do is to look closely at the current conditions on earth and begin to weave those details into the mythology of the named planet. What’s so amazing is that when one looks backward to the history, it is so clear how each planet and it’s astrological interpretations are ideally reflective of the conditions on earth. 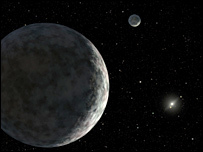 Eris was officially announced to the world in July of 2005. In mythology she was the goddess of strife, discord, contention and rivalry. Hmmm, look around. See anything? The State of The Planet, perhaps? This is how it works when a new energy enters into our consciousness. Because Eris is so very far away she tends to remain in a zodiac sign for a very, very, very long time. She’s been traveling thru Aries now since April 1924 and she’ll be in that sign until 2045. Where is Aries in your natal chart? One way to think about this would be to draw an analogy to the place where you live. Imagine for a moment that tomorrow when you wake up your home has suddently doubled in size with brand new rooms you’ve never seen or entered into before. It might take some time to ‘process’ that new information! For now there’s nothing more to think about other than to figure out where in your life are you experiencing strife, discord & rivalry and how to deal with it. I suggest attending a yoga class.